Steam baths have been a popular way of bathing for thousands of years. They were known to the ancient Greeks and have long steam bathing traditions in both Turkey and Russia. Today, steam baths can be found in most spas and gyms. They are also becoming increasingly popular for home installation. Thanks to recent developments in steam generator technology steam baths can be installed in almost any residential bathroom. We often hear the terms steam bath, steam shower and steam sauna. Do they mean the same thing? Strictly speaking, a steam bath is an enclosure which is kept at about 45°C. It is fed with a steam generator which produces thick clouds of mist. The room has to be fairly well sealed to prevent the steam from escaping and also to prevent moisture damage to the surrounding structure. A steam shower is basically the same as a steam bath but on a smaller scale. It is usually big enough for one or two people and can be installed in a standard shower stall. Steam showers are often used for residential steam baths. A steam bath is sometimes called a steam sauna but a sauna is actually a different type of bath. A Finnish sauna produces a dry heat and is much hotter than a steam bath. 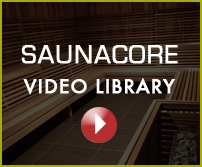 Saunas are usually heated between 70°C and 100°C. Steam is produced in a sauna by pouring water over hot rocks, but usually the air is quite dry — around 20% humidity as compared to 100% humidity in a steam bath. Many people would like to have a steam shower installed in their house but are concerned about the build-up of humidity. If you have a fairly modern bathroom with an enclosed shower stall, you can easily install a steam shower without any concerns about excess humidity. The steam shower has to be an enclosed unit to contain the moisture and to allow it to drain off. If you don’t have an enclosed shower stall or bathtub, existing bathtubs can be modified to accommodate a steam shower. If you have a large bathroom, the other alternative is to install a separate steam shower. The steam generator does not have to be in the bathroom. It can be installed up to 40 feet away from the steam shower. The generator needs an adequate electrical connection, and some models also need to be connected to a drain. The steam generator is connected to a steam head which is installed in the steam bath itself. Some steam heads have built in controls while others are controlled with an external unit. It is more convenient to have the control inside the steam bath itself so that you can make adjustments as needed. Since steam baths are so relaxing you will likely spend more time there than in a normal shower. This means you should also install some kind of seating arrangement. The steam heads should be installed away from the seating area so that the possibility of being scalded with the hot steam is reduced. All of this installation work requires specialized plumbing and electrical skills.